All value investors today should keep the analogy in mind, and implement the overall concept. To assist in that goal, ModernGraham has various tools available, and the infographic shown above is one of them, displaying a summary of the valuations of 505 companies reviewed by ModernGraham. Each valuation can be found in the Valuation Index, available for free, or premium members can access more detailed information including screens and tables of the valuations. 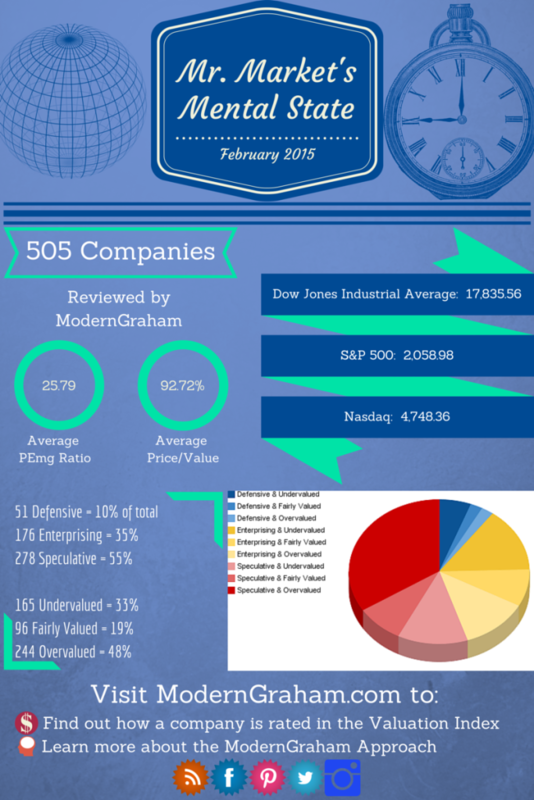 This month, out of the 505 companies reviewed by ModernGraham, the average PEmg ratio (price over normalized earnings) is 25.79 and the average company is trading at 92.72% of its intrinsic value. Last month, the average PEmg ratio was 25.63 and the average company was trading at 93.48% of its intrinsic value. The highest PEmg average we have seen while tracking this information was 26.17 in December 2014 while the lowest PEmg average was 24.29 in October 2014. The highest average intrinsic value was 93.48% in January 2015 and the lowest average intrinsic value was 90.24% in October 2014.